Having decades of Nordic engineering experience from the World Cup circuit, Rossignol continually pushes the boundary of the low-end on the weight scale. You might think something is missing when you heft these boots, but you get what you see: boots that excel for racers ranging from top-end High School Nationals racers to Olympic and World Cup athletes. Rossignol knows what stiff means, but they also know that too much stiffness can make for a dead boot. That's why they construct their soles in two parts, so that they boot is not only extremely notionally rigid, but the soft toe flex at the metatarsal gives incredible precision for kick and ski feel. This, combined with the carbon edge heel counter, ensure you get a precise feel and all the performance you need. These finely-tuned boots fit narrow for precise ski feel, and the zipper runs directly down the front to take them off easily between races or after practice. 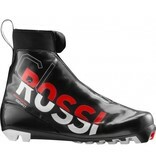 Rossignol eliminated the zipper, the weakest point on any boot, completely for durability. The fast lace system, neoprene sock and thermo formable cushion ensures a precise fit. And the X-celerator sole is compatible with all NIS Rottefella and Salomon Pro Link New Nordic Norm bindings.